Welcome to Laurance Sawyer's BLUEBIRD HOUSING! We specialize in custom-made, rustic log bird houses. Not only do we hand make Bluebird Houses, we also hand make Chickadee Houses, Owl Houses, Duck Houses and Woodpecker Houses. We are located in the North Georgia Mountains in East Ellijay in Gilmer County. 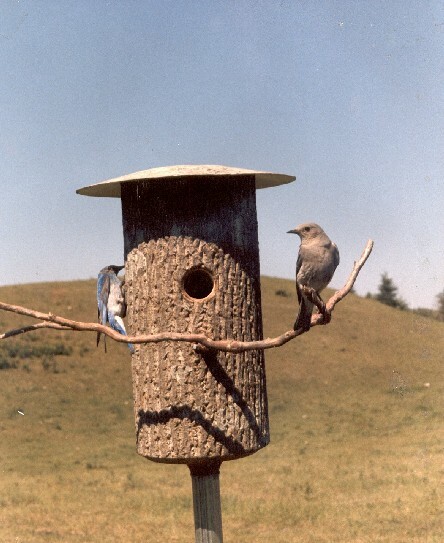 Our bluebird and other bird houses provide a safe and comfortable shelter for just about every bird you would want to attract. Each house is custom made and the entrances are drilled to exact specifications to allow only certain species to fit into the nest. 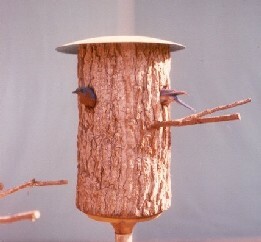 The birdhouses fit smoothly on metal poles and have tapered bottoms and removable roofs. Fallen trees are the primary source of wood. Poplar is the most popular with our customers, but cypress, sycamore, white birch and ponderosa pine are other types of wood used. Some customers have had their birdhouses for over 20 years and they still are in use at their homes. 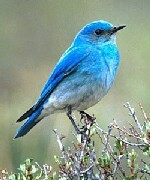 Bluebird Housing was established in 1972 by Laurance & Adelaide Sawyer after he retired from his "regular" job. He created a machine which he called the "Woodpecker Lathe" to hollow out the wood to form the birdhouses. The business took off and in "birding circles", Laurance Sawyer became known as the "Bluebird Man of Georgia". Click here or click the "Bluebird Man of Georgia" button to read the article published in the Chattanooga News - Free Press about Laurance and Adelaide Sawyer and their Bluebird Housing. The family love for birds and birding did not just start with Laurance Sawyer. His father, Edmund Joseph Sawyer was known as the "Dean of American Bird Artists". Published numerous times in the Audubon Society's Educational leaflets, his paintings still inspire bird lovers around the country. E.J. Sawyer was appointed Yellowstone Park's Park Naturalist in 1924 where he served until being asked to serve as New York State field ornithologist. Click here or on the button "Dean of American Bird Artists" see read a loving tribute to E.J. Sawyer by his son, Laurance Sawyer. After Laurence passed away in 1994, his wife and lifelong partner, Adelaide, has kept the family business going strong with her daughter and son-in-law Elaine Sawyer Whittemore and Edward Whittemore. Marvin Sawyer, Laurance and Adelaide's 2nd son, an accomplished machinist, made many updates and advancements in the machinery and techniques used to produce the beautiful houses. Tragically, he passed away in May 2000 after years of continuing the business before and after Laurance passed away. With Adelaide's wisdom and guidance, Bluebird Housing has already grasped the hearts of its 4th generation.